Mol an óige agus tiocfaidh sí. Bunscoil Lán-Ghaelach faoi phátrúntacht Ardeaspag Caitliceach Bhaile Átha Cliath is ea Scoil Lorcáin. Bunaíodh an scoil i 1952 chun oideachas trí mheán na Gaeilge a chur ar fáil agus chun suim sa chultúr Gaelach a chothú i measc na ndaltaí. Is scoil chomhoideachais í Scoil Lorcáin. Tá breis is ceithre chéad dalta sa scoil agus tá 18 múinteoir ranga, ceathrar Múinteoir Tacaíochta agus Príomhoide mar fhoireann lánaimseartha inti. Chomh maith leo sin, tá Rúnaí, beirt Chúntóirí Riachtanais Speisialta agus triúr glantóirí. Tá an scoil suite ar Chearnóg Eaton, leathbhealach idir An Charraig Dhubh agus Baile na Manach i nDeisceart Chontae Átha Cliath. Nílimid, mar sin, i bhfad ón bhfarraige agus ó líne an DART. Is as an gCarraig Dhubh agus Baile na Manach do 25% do na daltaí. Tagann formhór mór na ndaltaí eile ó mhórcheantar Dhún Laoghaire agus ó cheantracha eile ó dheas den scoil, roinnt acu ó Chontae Chill Mhantáin fiú. Is léir go bhfuil meas ar an scoil má tá tuismitheoirí sásta aistear fada a chur orthu féin chun freastal uirthi. Is í Muireann Ní Mhóráin Cathaoirleach na scoile. D’fhreastal sí féin agus a páistí féin ar an scoil. Is é Colmán Ó Drisceoil an Príomhoide agus is í Paula Uí Mhurchú an Príomhoide Ionaid. Tá an-suim ag an Máistir Ó Drisceoil san oidhreacht Ghaelach. Nuair a bhí sé níos óige d’fhreastal sé ar Scoil Lorcáin mar dhalta. Tagann na múinteoirí i Scoil Lorcáin ó gach cearn den tír, ón nGaeltacht, ó Bhaile Átha Cliath féin agus ó áiteanna eile. Tá taithí againn ar na canúintí éagsúla mar sin, rud atá suimiúil agus úsáideach. Is iarscoláirí de Scoil Lorcáin cúigear eile de na múinteoirí atá sa scoil faoi láthair. Is iad na tuismitheoirí a bhunaigh Scoil Lorcáin an chéad lá riamh. Tá Coiste na dTuismitheoirí an-ghníomhach i gcónaí. Reachtálann siad Aonach na Nollag, ranganna Gaeilge, ócáidí sóisialta, Lá Spórtanna agus imeachtaí eile a chuireann le saol na scoile. Cuirtear a lán imeachtaí breise ar fáil do na daltaí i Scoil Lorcáin. Tá ranganna iarscoile a chuimsíonn Ealaín, Ceol, Spórt, Ceoldhrámaíocht agus Club Obair Bhaile á reachtáíl ag grúpa múinteoirí faoin teideal Seirbhís Iarscoile Scoil Lorcáin. Foghlamaíonn na páistí Tae-kwon-do agus na Cluichí Gaelacha i rith am scoile ó mhúinteoirí speisialaithe. Tá foirne iomána/camógaíochta agus peile againn sa scoil. Imríonn buachaillí agus cailíní ó Rang 3-6 ar na foirne seo. Má tá níos mó eolais uait faoin scoil tá fáilte romhat teagmháil a dhéanamh le hOifig na Scoile ach is é an bealach is fearr le heolas a fháil na labhairt leis na daltaí agus leis na tuismitheoirí atá sa scoil faoi láthair nó an Nuachtlitir mhíosúil atá le fáil in áit eile ar an suíomh seo a léamh. Scoil Lorcáin is an All-Irish Primary School or Gaelscoil under the patronage of the Catholic Archbishop of Dublin. We were established in 1952 to provide Irish medium education and to develop an appreciation of Irish culture amongst pupils and their families. We are a co-educational school. We have 491 pupils, 18 class teachers and four fulltime Learning Support Teachers as well as an Administrative Principal. We also have a secretary, two Special Needs Assistants and three cleaners. The school is situated in Eaton Square on the boundry of Monkstown and Blackrock, near to the sea and the DART. 25% of our pupils come from this locality and the rest from the greater Dún Laoghaire area and even from as far south as Co. Wicklow. There is clearly a respect for the school when parents are willing to travel so far to enable their children attend. Muireann Ní Mhóráin is our Chairperson. Herself and her own children attended the school. Colmán Ó Drisceoil – a past pupil – is Principal and Paula Uí Mhurchú is Deputy Principal. Colmán is very interested inour culture. 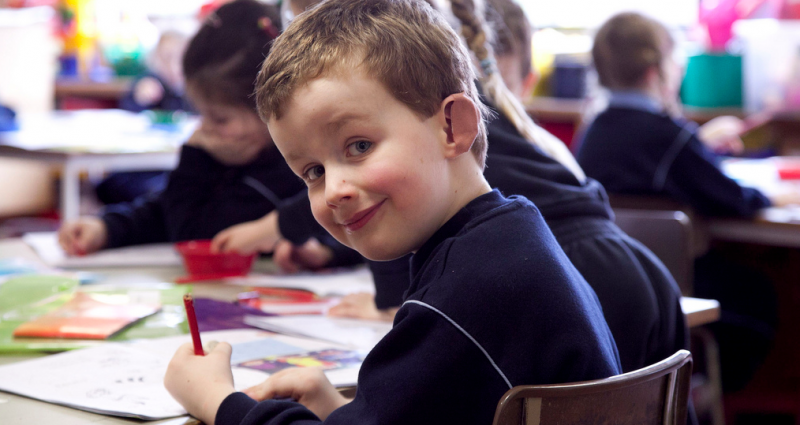 Our teachers come from all over Ireland, from the Gaeltacht areas as well Dublin and other counties. This gives the children access to the various dialects of Irish which is enriching and rewarding. We currently have 5 past pupils as teachers. We organise a lot of extra activities for the children. A group of teachers have come together under the name Seirhbís Iarscoile Scoil Lorcáin and provide after school activities involving Music, Art, Sport, Traditional amd Modern Singing and Homework Club. The children learn Tae Kwon-Do and Gaelic Games from specialist teachers. We have hurling and football teams for boys and girls from Rang 3 up. Scoil Lorcáin was, reputedly, the first school in Ireland to be set up by a group of parents. Coiste na dTuismitheoirí – our parents’ committee – has always been and continues to be very active. They organise Aonach na Nollag (Christmas Fair), Irish classes, social events, Sports Day and many other events. Parents are encouraged to become involved in the school life. We established a Green Schools committee some years ago and have been awarded the Green Flag for our environmental awareness campaigns. If you seek further information you may contact the school office but the best way to get to know the school is to talk to parents and children of the school and to read our monthly newletter.